This TTC Insight analyzes 10 years of data from Cup of Excellence competitions and auctions to show how a careful and concerted effort to restructure specialty coffee purchases delivers pricing patterns that many are looking for in the broader specialty market. This TTC Insight uses Counter Culture’s Transparency Report data to see what happens to green prices when a coffee is sold as a named single-origin coffee. With help from Meredith Taylor, Sustainability Manager at Counter Culture, we discuss the implications of this $1.64 (46%) price premium. This TTC Insight analyzes three years of green pricing data provided by an established coffee estate in Costa Rica. In addition to providing benchmark information for other specialty coffee growers, these 140 contracts from the 2013/14, 2014/15 and 2015/16 harvests provide insights about the effects that coffee quality, purchased quantities, and prevailing commodity prices have on green specialty coffee prices. Transparent Trade Coffee is considering an important change to its data-reporting practices. Learn how this movement to the Return to Origin (RTO) language serves as a permanent reminder that the true economic treatment of coffee growers depends on the contributions and compensations of a range of in-country actors, which vary greatly across coffee-growing regions and countries. Thanks to Temple Coffee Roasters for introducing the RTO vocabulary to the specialty coffee sector. 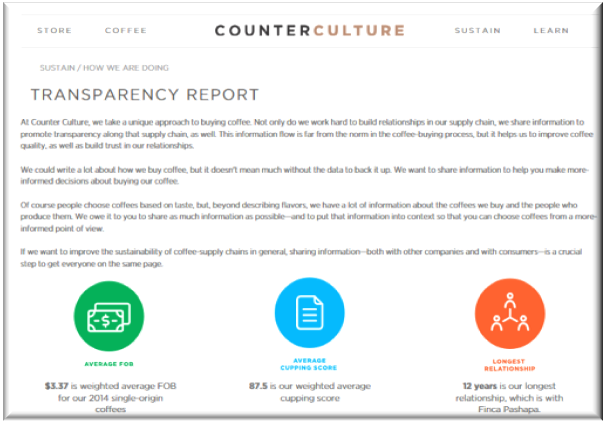 In October, Counter Culture released its most recent Transparency Report - a must-read for individuals and organizations interested in transparent transactions within the specialty coffee sector. In this TTCoffee Insight, we complement their descriptive statistics by examining the inter-relationships among the variables summarized in the report. For those trying to divorce specialty coffee pricing from the vagaries of commodity market pricing, these observations suggest three useful rules-of-thumb. The TT Coffee Team takes a closer look at how 26 SCRPI Roasters talk about pricing transparency on their websites. Our latest Insight puts structure around these 26 transparency statements and provides click through links to give you a better idea about the context of each statement.